OK I admit it. I’m a bit of a Franklin Christoph fanboi. There said it. Being the wrong side of the pond to attend US pen shows, means most of mine have been bought directly from the website, so purchases tend to be carefully thought out and I wait for specific colours, rather than just going for what is available. 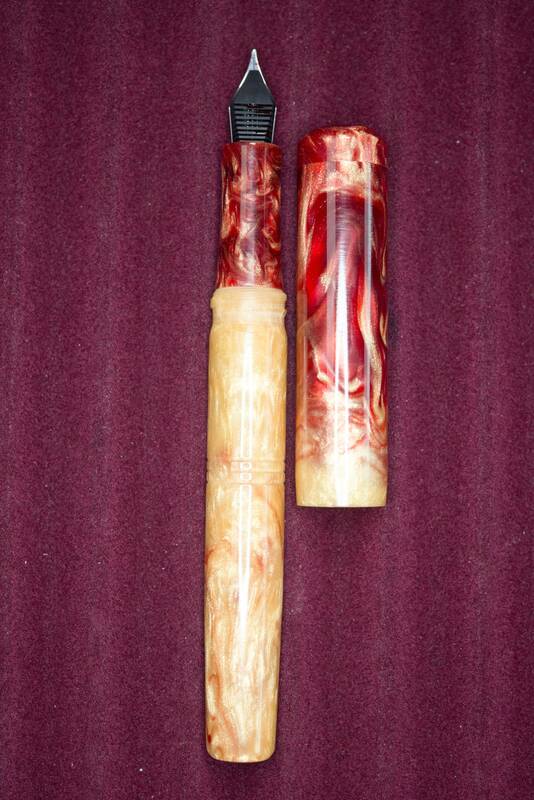 However, the limited editions, in more recent times made from Jonathon Brooks acrylic rods, can grab me. 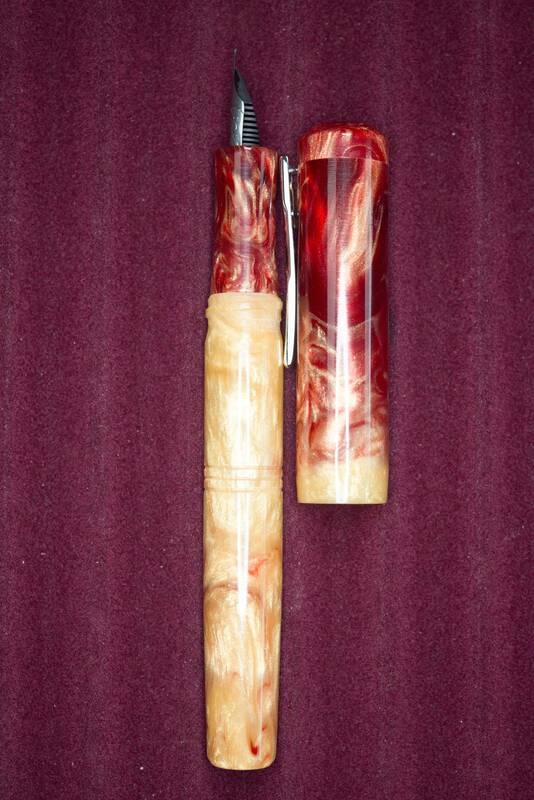 I ignored two of real interest as I had this pen lined up and all things Kickstarter take time and tend to run late. The P.I.F. project, a non-profit group who provide free bags of freshly serviced/cleaned fountain pens and inks to hand out to new users, started a Kickstarter campaign back in January 2018, with an expected delivery time of September the same year. 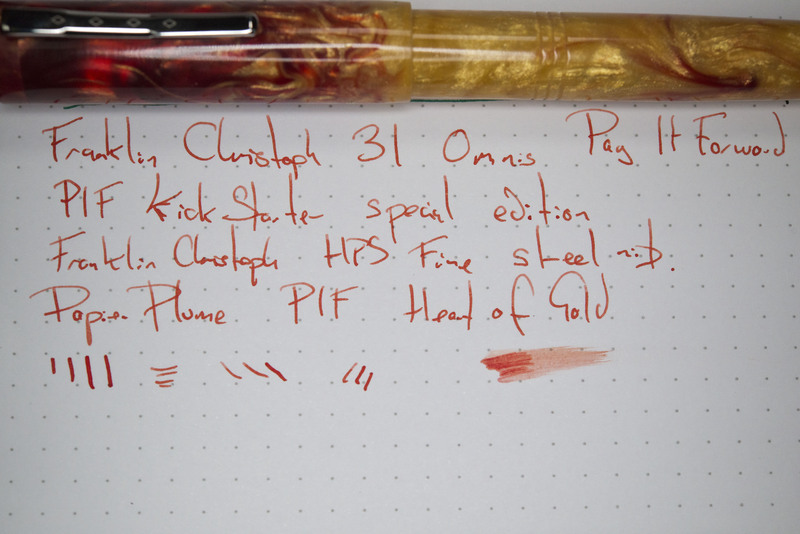 The central pledge item many, including myself, would go for was a Heart of Gold Franklin Christoph model 31 fountain pen, made from a fiery red, orange and yellow acrylic created specifically for this project by Jonathon Brooks of the Carolina Pen Company (I believe the ink and notebooks were also PIF project specific). In true Kickstarter fashion September came and went, and for one reason or another the pledge rewards which included the pens were not shipped until February 2019. So my pen, notepads, and ink arrived. Eagerly I opened the well packed box (done by the PIF crew), opened up the clamshell pen case (the leather sleeves are used for pens directly from Franklin Christoph only , 3rd party sold pens come in traditional boxes) and … well it was not quite what I was expecting. 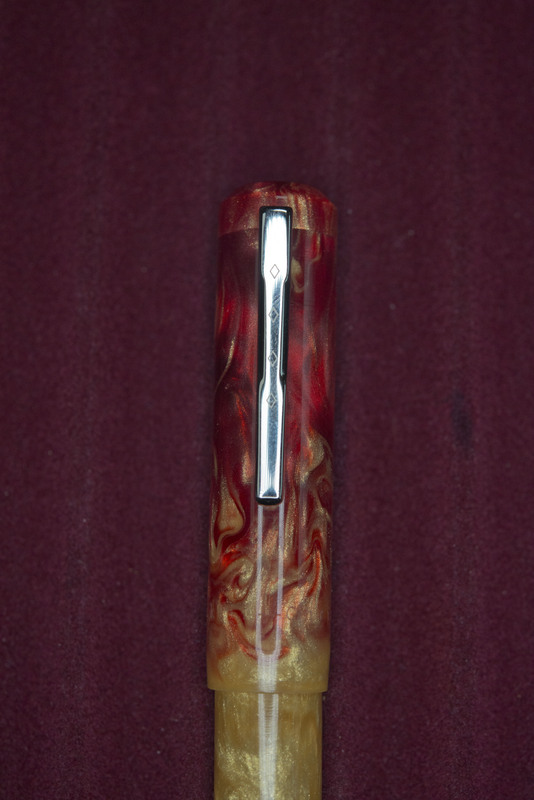 If you look at the link about for the Kickstarter campaign (above) you see pictures of red, orange, and yellow along the whole pen in fiery swirls. Mine had a mainly orange/red cap and grip, and a near entirely yellow barrel. I was not impressed, and on line I saw complaints from others for the same reason, not helped by some of the latter people showing pictures of the pens we actually expected. 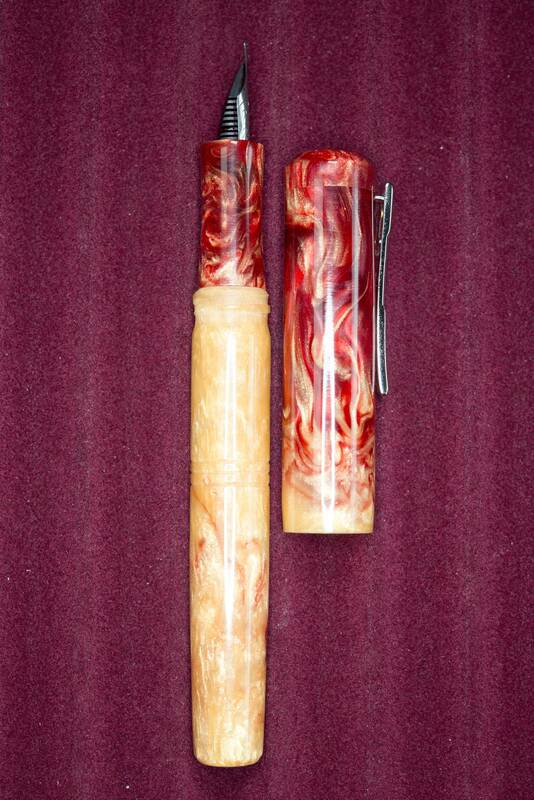 It should be noted that Franklin Christoph (who have explained in a post) were provided with the rods and so did what they could on making the pens, then assembled and passed them on to the PIF crew, who then packed the orders, selecting boxes with nib size markings on them. When closed it actually works very well with the yellow of the barrel merging in to the red of the cap through the yellow ring at the cap opening. Uncapped it looks less cohesive as you have a red/orange grip and a yellow barrel, no transition. It has grown on me and I’m keeping the pen as I do now really like it, but I can’t say I was overjoyed at the time. 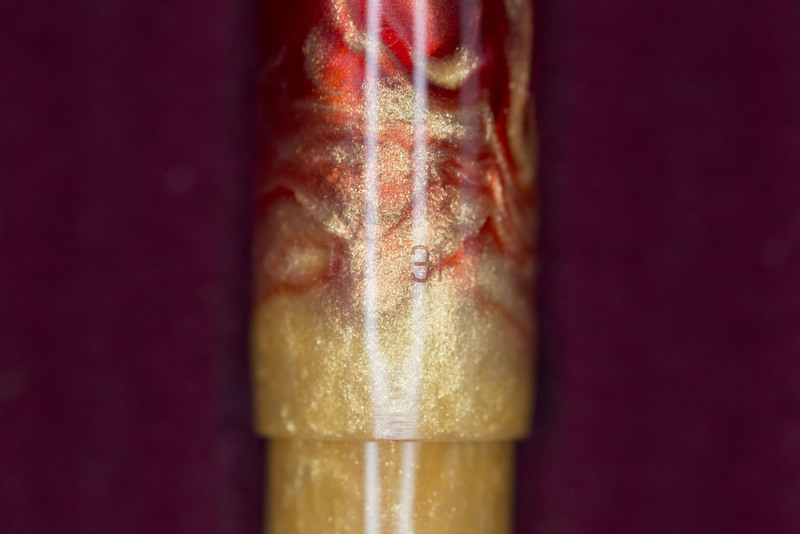 When looking at the pen, even in the long stretches of the yellow barrel it has lots of subtle swirls, glitter, chatoyance, and depth, however it’s the red parts where the 3-D nature of the material really strikes home. Quick overview time before I properly review the pen. Franklin Christoph is a small manufacturer from North Carolina in the USA who produce a range of distinctive pens of their own designs (no generic shapes from them) in limited sized batches. Overtime they have developed an ever increasing loyal following and fan base. 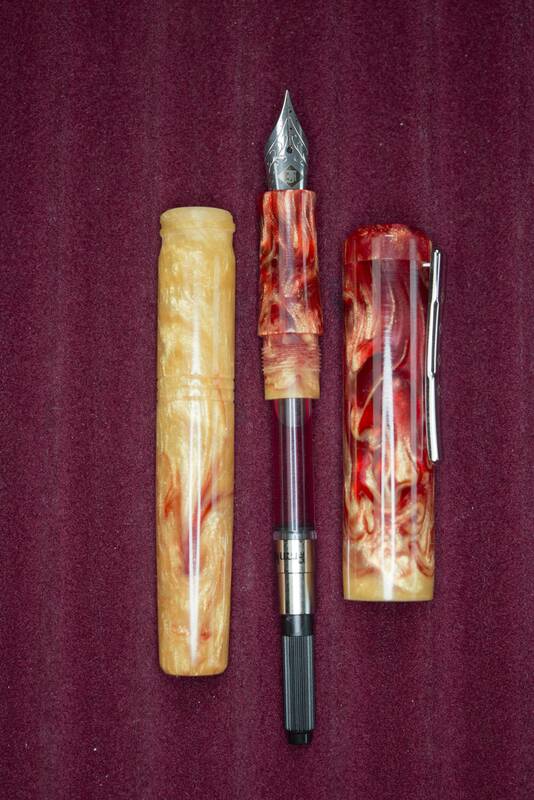 The Pay It Forward project (PIF) are a group of like minded people who host a table at many of the US pen shows. Their whole aim is to pass out free pens and ink to new users and passers by (to try and help draw them in to the world of fountain pens). The group are reliant on the donations of surplus and no longer required pens and bottles of ink, plus donations to enable them to travel to/from the pen shows and pay for the table (if required). So back to the reason you’re reading my ramblings. 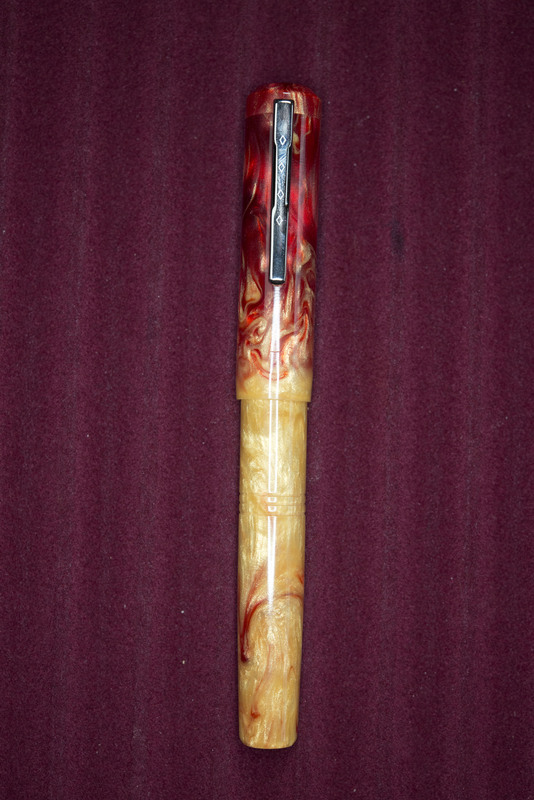 The pen itself. The cap is a straight tubular design with the finial being a separate disk, securing the clip. About an inch above the bottom of the cap, Franklin Christoph 31 is laser engraved. This is very hard to see due to the chatoyance of the acrylic. 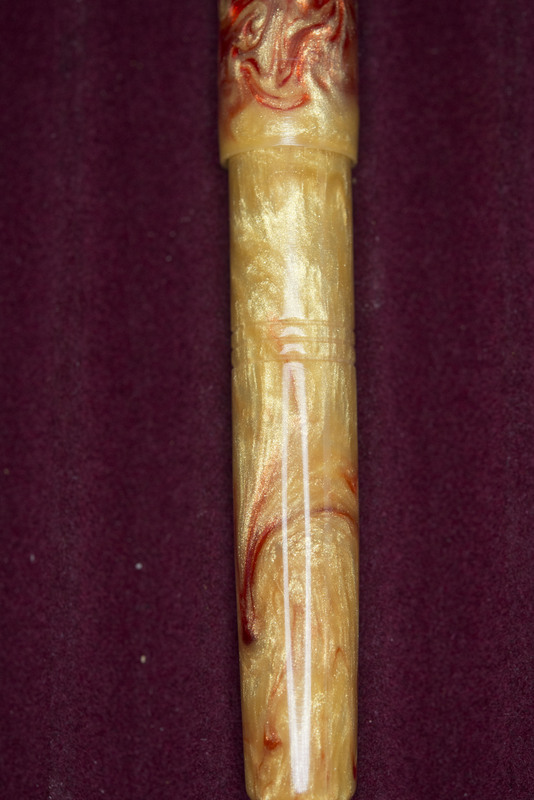 The barrel tapers at a gentle angle towards the base and has three concentric rings about half way along. This is purely cosmetic. 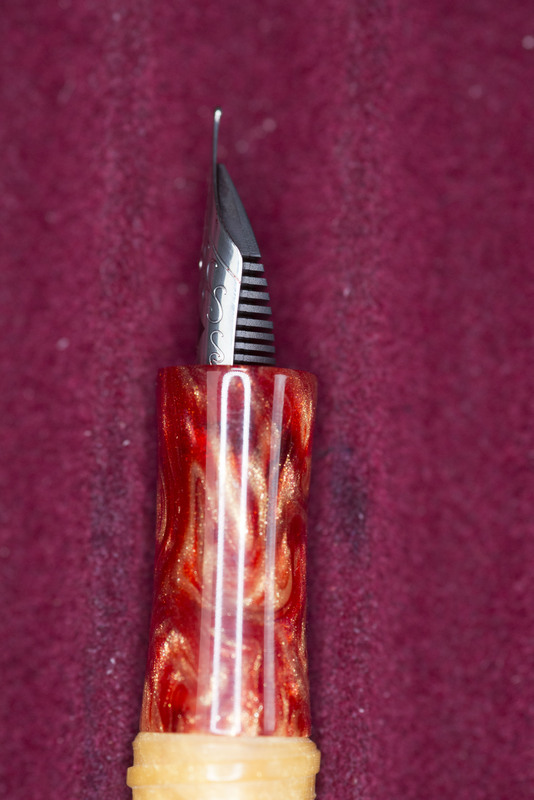 The nib section curves in from the barrel, then curves out again towards the nib, with this end being narrower than at the threads. 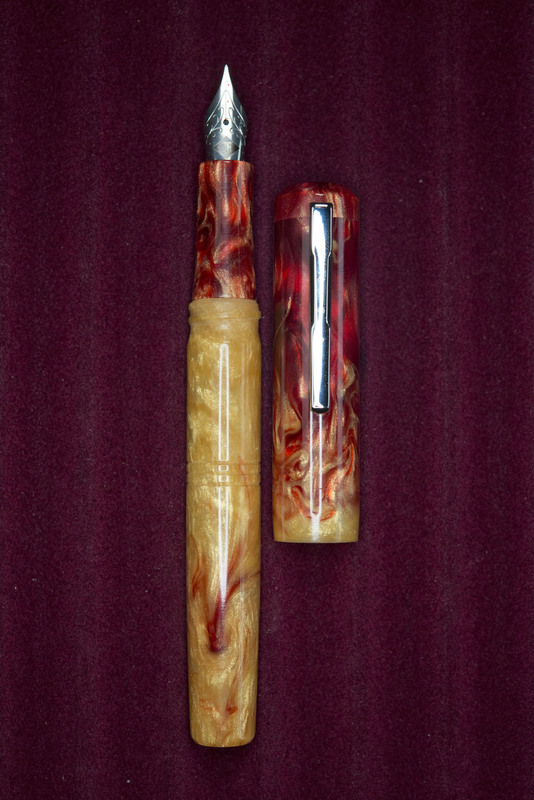 It’s a nice shape and about the only thing on this pen which could be accused of being traditionally designed. It is comfortable to hold though someone preferring a wider pen may find the section a little too thin. The capping threads are on the end of the barrel section and use a single short wide thread, which can be felt but is not sharp. If I were to be picky, I much prefer it when F-C place this sort of thread by the nib but it does not cause me a problem or make holding the pen uncomfortable. The finials are flat with bevelling around the edge. The top one is a separate disk and has the Franklin-Christoph logo etched into it. The bottom one is plain. Note the white rings on the photos are just the reflections of the lighting used with the camera. Size wise it is a long pen. 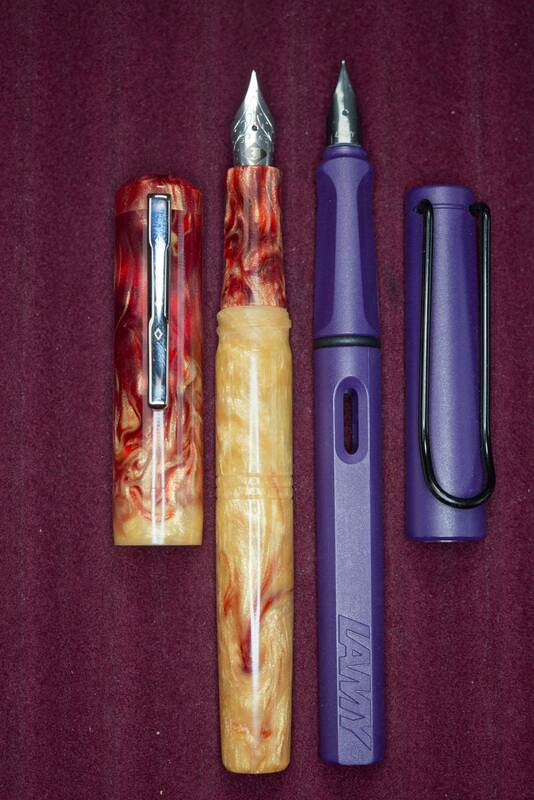 Comparing with the ubiquitous Lamy Safari, which itself is quite long, it can be seen that the 31 is also slightly wider, though the hour glass part of the grip section is on the narrower side. 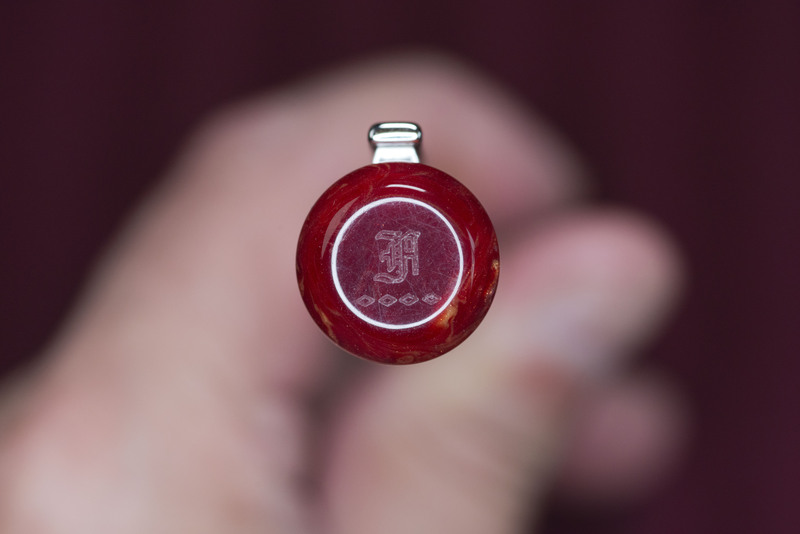 The cap does securely post, but partly due to the type of material, it does result in the pen becoming somewhat back weighted. 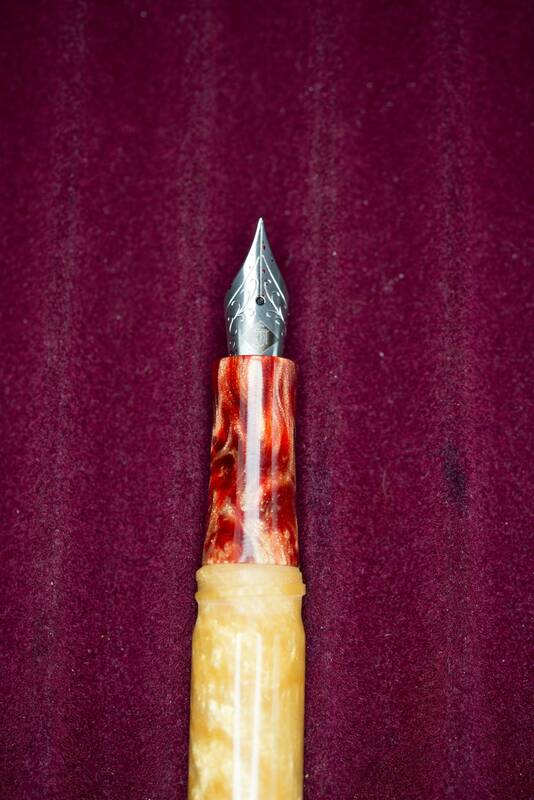 The nib is part recessed. Some people do not like this as it can make cleaning harder to do and also affects the looks of the pen. Personally I have no problems with it. 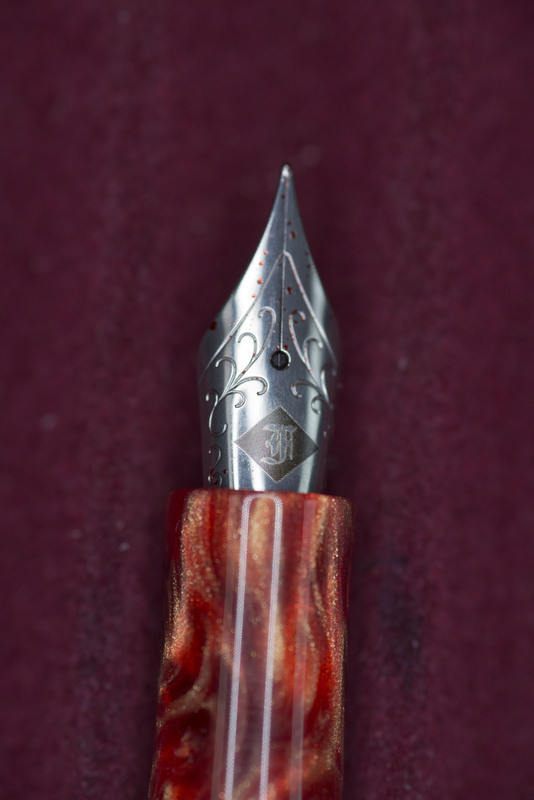 The nib is a JoWo size 6 steel affair, stamped with a Franklin Christoph logo. While none of the speciality nibs are available on new pens not bought directly from F-C, the available ones, described as HPS, are still all hand cleaned, tested, and tuned by the Franklin Christoph in-house nibmeisters (so not by Mike Masuyama) before the pens are sent out. I seem to remember the options were EF, F, M, B, 1.1 and 1.5, all steel. 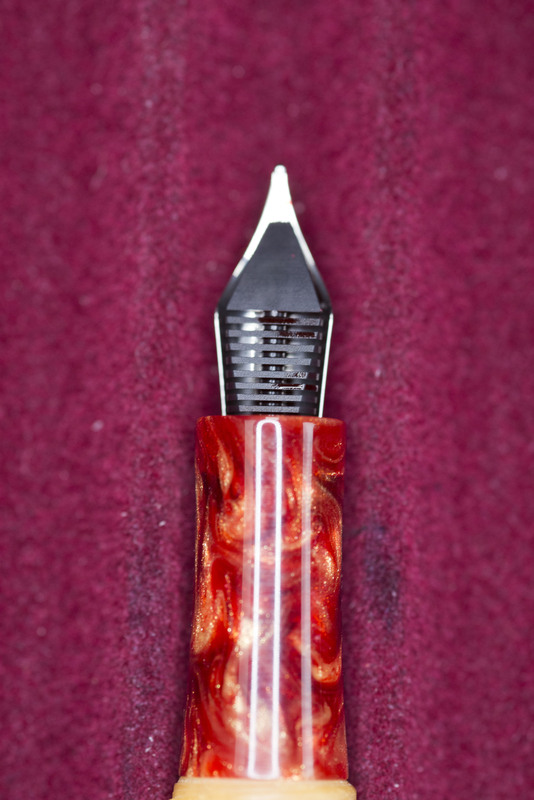 The feed is the appropriate JoWO plastic feed, and both it and the nib are held in an assembly that can be unscrewed from the pen for cleaning or for swapping to another Franklin Christoph of JoWo nib. The pen takes standard international cartridges and converters and comes with the latter installed. 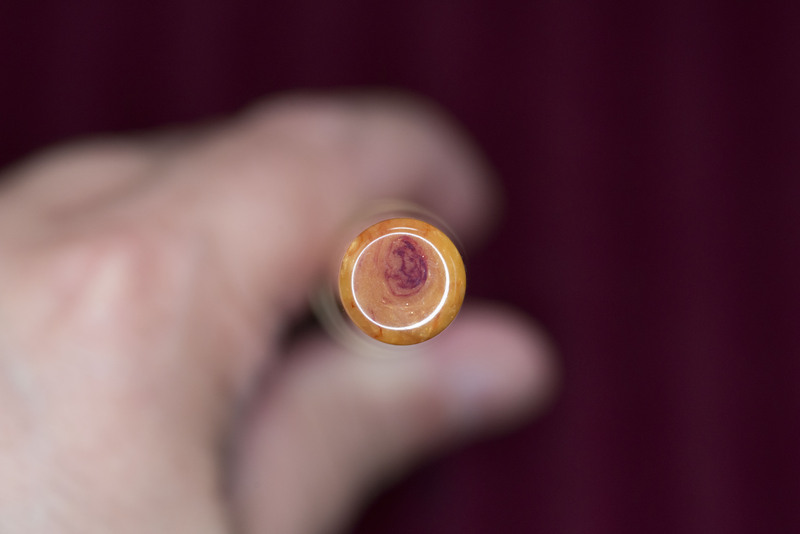 As most, if not all, of the Heart of Gold pens were to come with the limited edition ink, no cartridges were supplied. The clip is sprung. 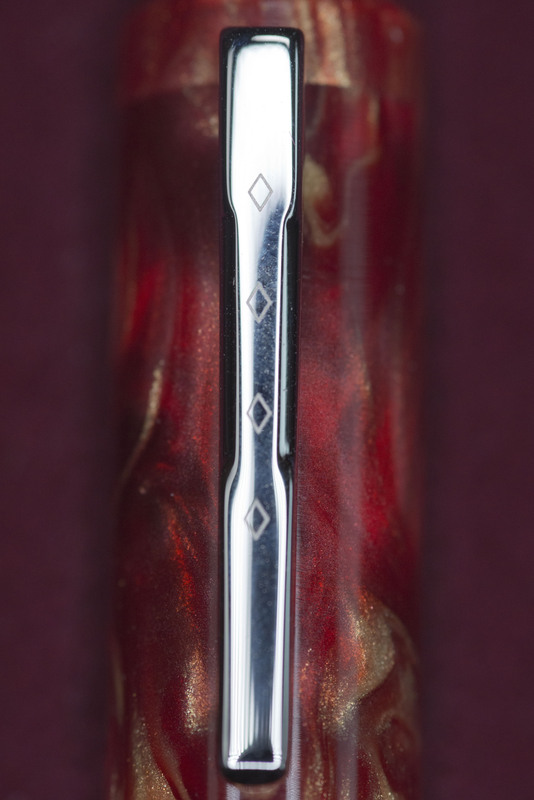 It is a shaped bar with the Franklin Christoph diamonds on it, and is screwed to 90 degree piece which goes in to the cap and is held in place by the finial. It is heavily sprung, but there is enough of a gap to easily use it, something that I have found is not consistent on the F-C pens. 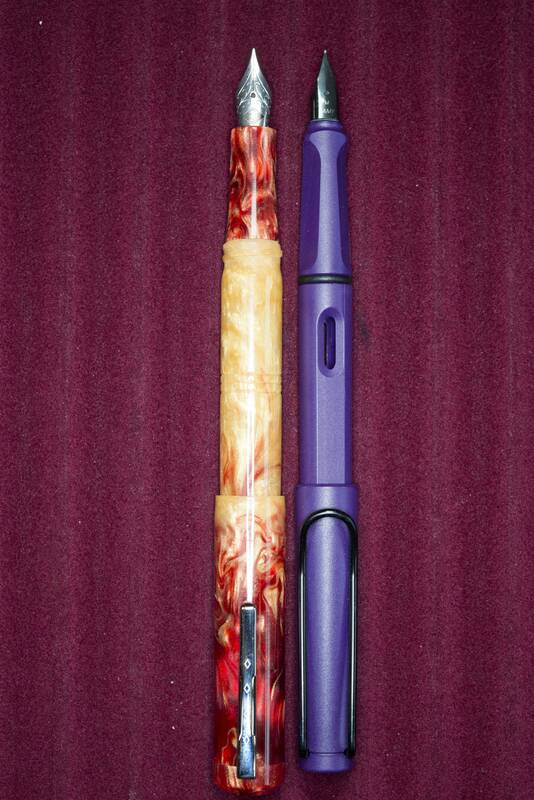 It works well and holds the pen securely in a pocket. The profile of the clip is some what vintage in nature. The writing experience is as you would expect from a well sorted JoWo sourced steel nib. Mine is a fine and flows smoothly, laying down a wet line of ink. 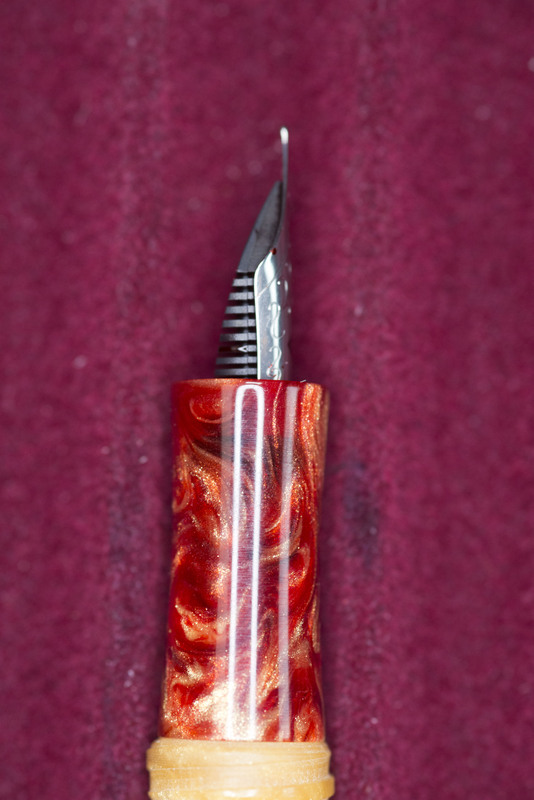 It is very pleasant to use and I have the pen loaded with the limited edition PIF ink, Heart of Gold by Papier Plume. This is an orange/red colour which I think actually works best with a juicy finer nib as a test swabbing I did made it look too light for my personal tastes. In this pen I like it. it is a comfortable pen to use, though possibly a little too thin for my personal tastes. So, aside from my initial thoughts on the pattern distribution, the four months delay in shipping, the cost increase due to duty and tax (on top of the high Kickstarter international postage costs), I am actually glad I got the pen. It is different, and the excessively yellow barrel has grown on me. I do enjoy just looking at it and letting the light bounce off the patterning, especially the redder parts. This is also a pen I could easily sell if I change my mind. Due to popularity and limited numbers of Franklin Christoph pens, you can normally sell them second hand for near or the same as you paid for them (and sadly people do profiteer with their retailer limited editions (such as the model 45 made specifically for Vanness Pens)). 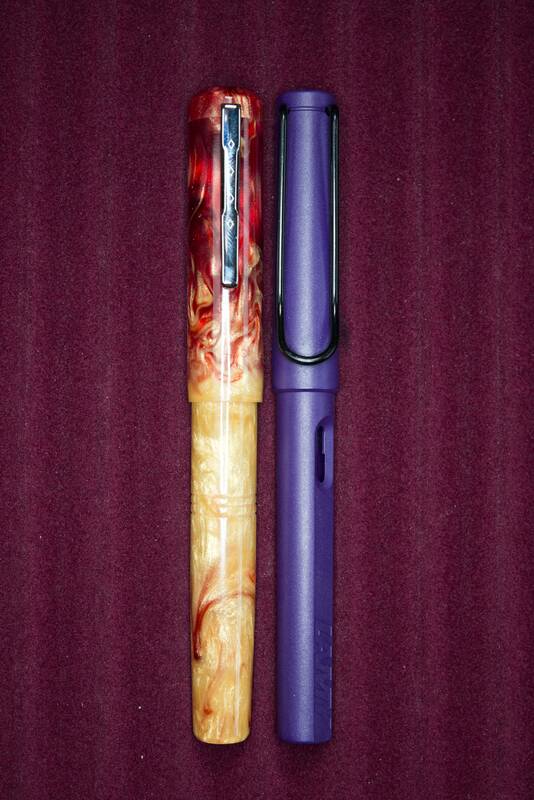 I actually had two offers on one forum when I first posted a picture of my pen as a NPD. Uniquely Franklin Christoph pen design. Poor patterning on the barrel. Kickstarter (I assume) high international shipping charges ($30 !!). If you want one and did not order it through the Kickstarter campaign, then expect to pay a premium IF you see one available.